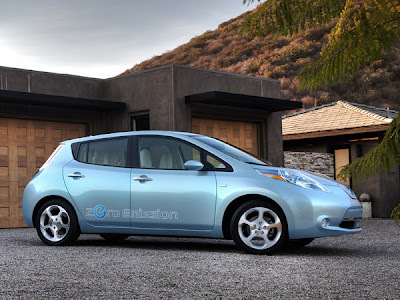 Home » Nissan » First Shipment of Nissan Leafs Arrive in Europe. First Shipment of Nissan Leafs Arrive in Europe. The first regular shipment of 100% electric Nissan LEAFs bound for Europe is today arriving in North East England. The 67 Nissan LEAFs aboard the ‘City of St. Petersburg', Nissan's brand new energy-saving car carrier for transporting vehicles in Europe, are destined for customers in the UK and Ireland and will be unloaded from the Port of Tyne as the carrier completes its maiden voyage. "The arrival of the Nissan LEAF, the world's first affordable, all-electric car, in Europe is a landmark day for Nissan and European transport. The Nissan LEAF is a genuine alternative to petrol and diesel cars in terms of style, features, safety, performance and handling," said Simon Thomas, senior vice president of sales and marketing at Nissan International SA, Nissan's European headquarters. "It is fitting that this first shipment of Nissan LEAFs is arriving on our new energy-saving car carrier, the City of St. Petersburg. We look forward to delivering these cars to the very first Nissan LEAF customers, who share our vision for an environmentally sustainable future for road transport," he added. The City of St. Petersburg has a sleek and semi-spherical bow which reduces wind resistance by up to 50%, resulting in fuel reductions of up to 800 tonnes annually, equivalent to about 2,500 tonnes of CO2 emissions. The carrier will join the fleet of ships which export hundreds of thousands of vehicles from Nissan Sunderland Plant each year. UK customers have been able to pre-order the Nissan LEAF since September 2010 ahead of deliveries starting in the coming weeks. Pre-orders for the Nissan LEAF, which is powered by an advanced lithium-ion battery, have reached more than 27,000 units globally. The zero-emission car is currently built in Japan, but will be manufactured in Sunderland from 2013, following the start of production of lithium-ion batteries for such cars at the plant in 2012. A comprehensive charging network is currently under development in the UK. North East England alone will have 1,300 charge points by 2013, including quick chargers capable of refuelling a Nissan LEAF from when the empty warning light switches onto an 80% charge in just under 30 minutes. Nissan's network of EV dealers - currently 25 sites across the UK - will all be equipped with a quick charger. Across the UK there are programmes under way to install around 9,000 charge points by 2013. Nissan research has found that 80% of daily driving in Britain is below 30 miles. With the Nissan LEAF's ability to carry five passengers up to 109 miles (175 km) under the New European Driving Cycle, its arrival in Europe marks a significant development in the environmentally-friendly, cost efficient options available for motorists.